PINK SHIRT DAY - BULLYING STOPS HERE! | ! *PurpleMoon Creations* ! PINK SHIRT DAY - BULLYING STOPS HERE! "Bullying can take place anywhere and it's important to speak up about it. Stand against bullying without saying a word by slipping into a pink T-shirt." PurpleMoon Creations invites you to wear a specially created mesh pink shirt for males and females and show your support against bullying. A minimum donation of L$10 is required but any higher amounts are appreciated! WHO ARE WE RAISING MONEY FOR? 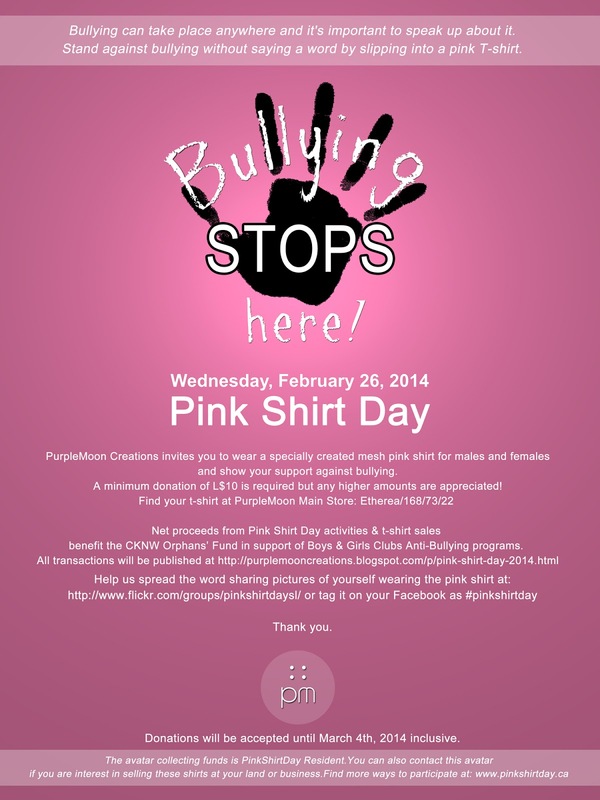 - Challenge your friends and co-workers to commit to a bully-free lifestyle and wear pink on Feb 26, 2014. Donations will be accepted until March 4th, 2014 inclusive. The avatar collecting funds is PinkShirtDay Resident. You can also contact this avatar if you are interest in selling these shirts at your land or business. Valentine's Group Gift from PurpleMoon! New Group Gift at PurpleMoon!